Cut a portion of the shallots into fine cubes. Chop garlic. Peel sweet potatoes and cut into small cubes. In a large saucepan, sauté chopped shallots and garlic with some vegetable oil. Add in sweet potato and continue to sauté for approx. 2 – 3 min. Add in vegetable stock, bring to a boil and let simmer on low heat for approx. 15 min. until the sweet potatoes are soft. In the meantime, mince remaining shallots and garlic. Roughly chop cilantro. Halve tomatoes. In a frying pan, sauté shallots and garlic until translucent. Add tomatoes and sugar. Season to taste with salt, pepper and chili powder. Stir in cilantro. Then remove from heat. Blend soup. Season with lemon juice, salt and pepper. 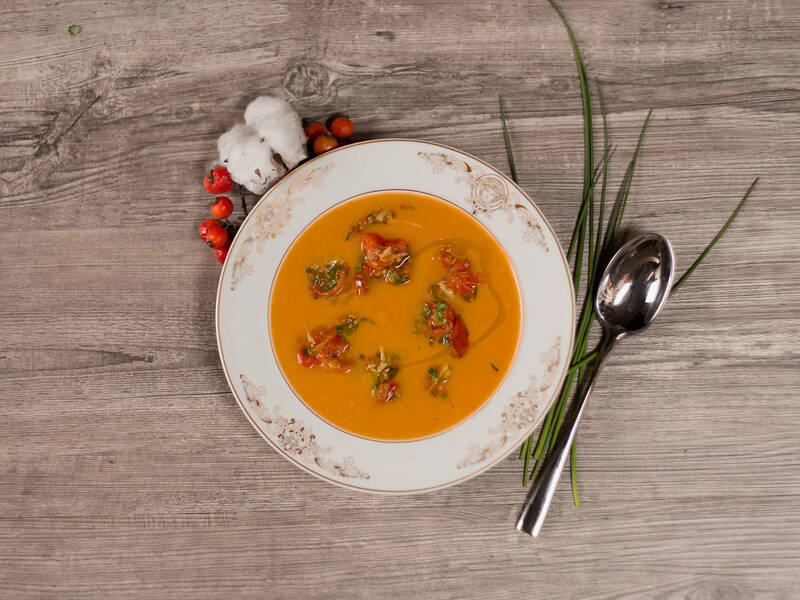 Serve in a soup plate with chili tomatoes and a drizzle of good quality olive oil.